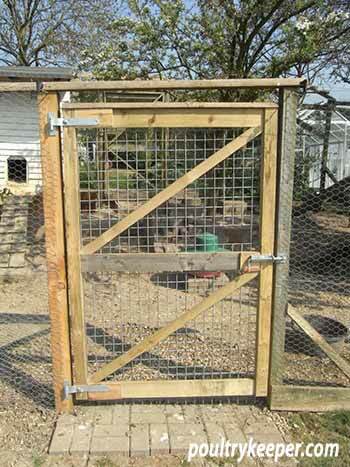 In this article, Jeremy Hobson looks at some ways of giving your chickens space, yet still keeping them free from danger by using a well designed poultry fence or pen. Some of the heavier breeds of chickens have, over the years, developed in such a way that their wings are hardly capable of doing much more than flapping and lifting a bird a few inches off the ground when danger threatens. Others, usually the lighter Mediterranean varieties, can fly quite well… and certainly into the branches of a nearby tree if pursued by a domestic dog or foraging fox. Many years ago, all types of chicken were able to fly well enough to be able to roost in trees; an evolutionary factor which was obviously essential to their survival in the wild. 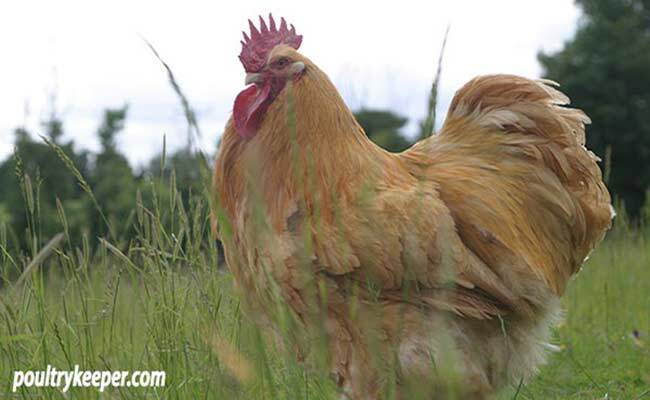 A large buff Orpington male who is unable to fly more than a few inches off the ground. Logically, it should be easier and cheaper to build an enclosure suitable for the heavier breeds such as Sussex or Wyandotte’s rather than one for Minorca’s or Ancona’s – and so it would if all one had to consider was their escaping. In reality however, an outside run in which birds are going to be allowed permanent access needs to be a safe and secure structure to prevent predators from getting in, rather than stopping your stock from getting out. Any chicken fencing I build always follows the pattern I used when employed as a gamekeeper and needed to construct large fox-proof pheasant release pens in the woodland areas of the estate. To protect against foxes and even wandering dogs, the fencing surrounding permanent poultry houses should be around 2m (6½ ft) high, with at least 30cm (1ft) dug into the ground (or turned out and pegged) to prevent anything from scratching under. Personally, I prefer to make the turn-out and first 0.6m (2ft) of the fencing from small-mesh wire netting as it adds strength and also helps to further protect. The remainder of the height can be made up of larger (and consequently cheaper) sized mesh. Ordinary galvanized chicken wire is perfect for the job, but make sure that it is of good quality – it will be more expensive than the cheap imports readily available, but it will last twice as long. Strain the tops and middle sections with a length of galvanized wire stapled to the posts (but do not hammer the staples right ‘home’, or they will pinch the wire and cause it to break) and leave the top of the wire netting protruding above the straining wire and slightly floppy so that it is more difficult for anything to climb in that way. Use strong posts: angle-iron ones with holes drilled at appropriate heights to allow a length of straining wire to be threaded through work well and will last a long time, but most people tend to use wooden stakes, which can be obtained (pressure-treated with a preservative) either from your local agricultural suppliers or a nearby wood-yard. When building the gateway, make sure that whatever method used to fasten it, is a secure one. A central bolt often seems safe, but you must never forget that a determined fox or neighbour’s dog pushing and scratching at its base could force an entry. Don’t forget to make the gate wide enough to allow for the passage of wheelbarrows, or any broody coops and runs that may be needed in the future. A nylon net over a relatively small poultry run can be a useful addition and should be kept taut by being held up with stakes – but be sure to place an upturned plastic plant pot on the top of each, otherwise the stake will eventually rub a hole in the mesh. 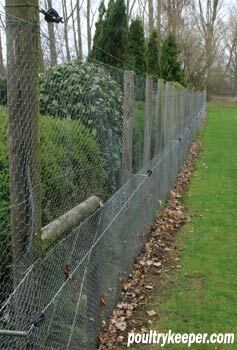 Alternatively, if your chosen breeds are of a type that are unlikely to fly out at any and every opportunity, rather than go to the expense of a high (and unnecessarily expensive galvanized fence) around your runs, you could construct simple wire netting fences of only about 1m (3ft 3in) in height and then, to give additional protection, place a temporary fence of ‘flexi-net’ or ‘electric poultry netting‘ some distance away. Basically, ‘flexi-net’ is a nylon fence, constructed in squares (in much the same way as traditional galvanized stock fencing), through which strands of wire have been woven – and usually comes in 50 metre rolls. The fence is then connected to an electric fencing unit and a pulse current is passed through the fence, giving anything that touches it, a similar shock to that which would be experienced if one were to come into contact with a single strand fence used to contain cattle. Gamekeepers use a double strand of electric fencing around the base of their pheasant release pens in order to protect their birds from foxes and this system may also be of value to the poultry keeper. 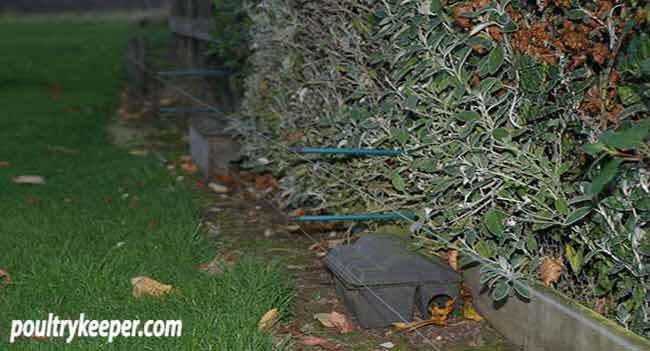 Wherever any type of electric fencing is being used, it is absolutely imperative that no grass or vegetation is allowed to come into contact with the fence line otherwise it will cause a ‘short’ and make the fencing far less effective, or even fail to work at all. Whilst a strimmer might be a good way of ensuring that the grass under an electric fencing is never allowed to grow long enough to short out the circuit, be very vigilant when using one: not just because of the obvious safety reasons, but also because of the fact that the cord or blade may cause unseen damage to the wire netting itself. 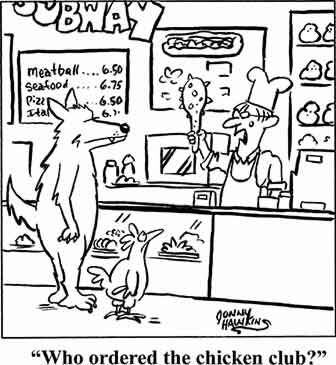 You might not notice it, but your chickens might – and a fox most certainly will. A strimmer damaged this wire netting which was difficult to spot at first. And, whilst on the subject of foxes, it is also worth noting that even a high wire netting enclosure such as I have described earlier cannot be guaranteed to be totally fox-proof. They are marvellous climbers and will scramble into your run via surrounding protrusions and nearby buildings. So, although the new pen might look like Fort Knox, it is perhaps as well to continue shutting your birds in their house each evening.